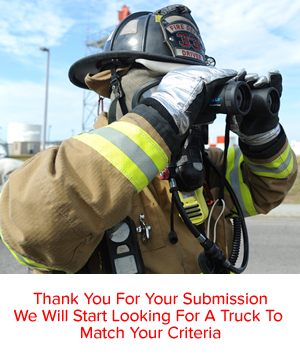 Take 30 seconds to fill out the form below, and get immediate updates when a truck meeting your wishes is listed! *Please select a type for your fire truck! Year Range *Minimum value must be smaller than Maximum value. Aerial Length *Minimum value must be smaller than Maximum value. Brands * *Please select at least one brand! Geographic Region * *Please select at least one region! Email Address * *Please enter valid Email address! We have updated your request for fire trucks. Something went wrong while submitting your request. Please try again! If the problem persists, contact our customer support.